BELTON – The University of Mary Hardin-Baylor football team will renew its rivalry with a former conference foe when the Cru travels to Seguin to face Texas Lutheran University in the first non-conference meeting between the two programs on Saturday. The game will be a battle between nationally-ranked opponents who both enter the contest with 6-0 records on the season. The Cru is 6-0 overall and has a 2-0 mark in American Southwest Conference play following a 45-24 victory over Louisiana College last Saturday in Belton. UMHB is ranked second in the country by both the American Football Coaches Association and D3football.com. TLU is 6-0 on the year and is coming off a bye week last Saturday. The Bulldogs knocked off East Texas Baptist University 55-49 two weeks ago in Seguin. TLU is ranked 17th in the nation by the AFCA and sits just outside the D3football.com Top 25 with the 26th highest-point total in the country in that poll. The two teams will be meeting for the 16th time in the last 17 seasons on Saturday. The series took a break last season following TLU’s departure from the ASC after the 2012 season. Three former UMHB players and coaches are coordinators on the Texas Lutheran coaching staff in Andy Padron, Mary Carey and Braxton Harris. The Bulldogs are also undefeated at their new, on-campus home in Bulldog Stadium, so this is a big game for both programs and could have playoff implications down the road. The Cru leads the all-time series with Texas Lutheran 14-1. The Bulldogs only victory in the series came in a 34-24 win over UMHB in Seguin in the 1999 regular season finale. This will also be the Cru’s first visit to Bulldog Stadium after each of the previous meetings in Seguin was played at Seguin High School’s Matador Stadium. 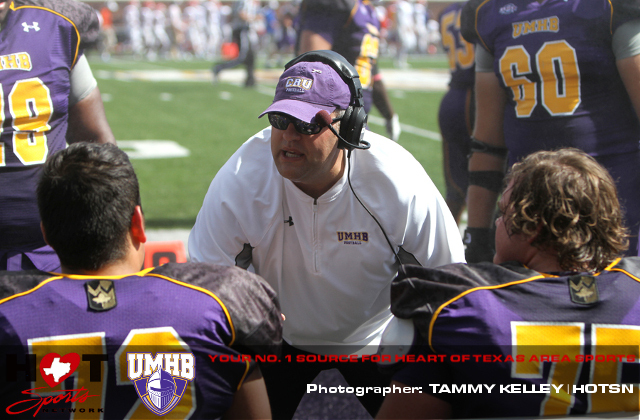 UMHB started its football program from scratch in 1998, the same year that TLU restarted its program following a ten-year absence. The two teams both competed in the ASC for 15 years before Texas Lutheran moved to the Southern Collegiate Athletic Conference for the 2013 season. Both teams are the defending conference champions in their respective leagues. Saturday’s game will be broadcast on K101.7 FM in Central Texas with the pre-game starting at 12:30 PM and kickoff set for 1:00 PM. UMHB will also provide live video streaming and Texas Lutheran University will offer live statistics for the contest. You can find links to all of the game coverage, including K101.7’s live audio stream, through the UMHB Athletic Department web site at www.cruathletics.com.